All transactions are safe and secure with a reliable history in online purchasing behind each of our associates. 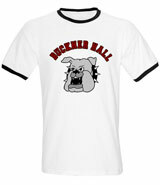 Buy the Buckner Hall Bulldogs t-shirts to own Switched at Birth clothing and merchandise. When it comes to athletics, Bay was never a big participant like her dad but Daphne is another story. Aside from being interested in the culinary field, she is a wonderful basketball player. It is one of the first things that helped bond the two after the discovery of the switch. He began coaching for her team at Carlton and continued until she changed teams. This Buckner Hall Bulldogs shirt shows the mascot for the school and team she chose to play for. In addition to the Buckner Hall Bulldogs tees above, browse the Switched at Birth Clothing Gallery for more apparel like men's and women's clothes, kids shirts or hoodies.